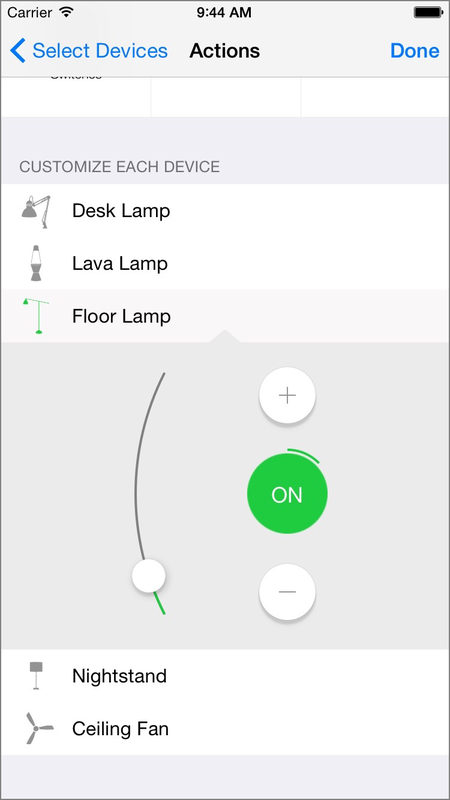 You can quickly control multiple types of devices with a single button by creating a scene. With a scene, you can lock your doors, turn off the lights and ensure the garage door is closed with a single tap from Dashboard. Scenes can also be controlled using Siri. Choose either a Quick Scene or a Custom Scene. In a Quick Scene, all devices of the same type behave identically. In a Custom Scene, you can configure each device independently. You can still use the Customize Similar Devices section to make quick sweeping changes. Tap a device type to change all devices of that type in the scene. In a Custom Scene, you can tap each individual device and customize how it will behave when the scene is activated. After you have added devices to a scene, you can use Siri to activate the scene. You can also activate scenes by tapping their icon in Dashboard.